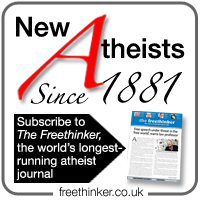 The March issue of the UK’s secular-humanist monthly, The Freethinker, is a “religious cartoons special edition”, featuring several Mo-toon fever inspired cartoons, a couple of Jesus-on-the-cross funnies, Jesus and Mo, one of the original “Danish twelve” (the “ran out of virgins” one – “turban bomb” and “horn head” were reprinted in the November 2005 issue, to a noticeable absence of outrage), and articles by Irshad Manji and Ibn Warraq, among other things. The other side of the argument is also presented. Shaykh Riyad Nadwion’s It’s a Question of Love, Newsnight, not Fear! is reproduced from the MCB’s website. Plus some of Irshad Manji’s hate mail for good measure. Closing one instance of free speech is a good reason to create a whole bunch more. How long before the islamic Nazis go for this magazine then? And the appeaser, Straw, makes whingeing noises about “offence” ? ?